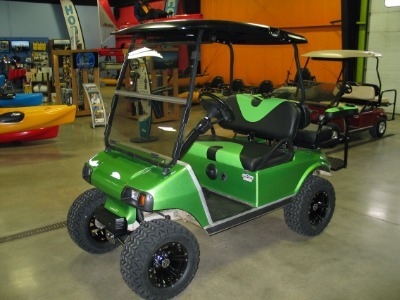 Customized 2008 Club Car DS electric. Professionally-maintained fleet vehicle, recently re-invigorated and amped up with new custom metalflake paint, new 6" lift kit, new wheels & tires, new light kit (headlamp & blinkers), new color-matched two-tone seats, matching rear flip seat (converts from seat to cargo platform) with arm rest/cup holders, new folding windshield, and new 5-panel mirror. Get noticed in this ride!! !